After the celebrated American Barrel Aged cigar range released by Camacho, the renowned Honduran firm released their Nicaraguan variant. Rather than ageing tobacco leaf in oak bourbon cask, this venture sought to showcase the flavours derived from rum. Having already reviewed the Camacho Diploma, we thought that we’d give the Nicaraguan Barrel Aged a try too. In this review, we’ll be exploring the exciting and original Nicaraguan Barrel Aged blend from Camacho. We will evaluate and review its aromas through each third as well as the rolling quality and overall experience. Although following the concept of the American Barrel Aged from the Master Built series, the Nicaraguan is in itself a unique cigar. Firstly, the Nicaraguan Corojo leaves are aged in Flor de Caña rum barrels. Interestingly though, these particular oak barrels were first used for ageing bourbon. Therefore, there is something of a shared ancestry between the two ranges. Whilst the American Barrel Aged would develop flavours thanks to the bourbon barrel’s charred interior, the Nicaraguan will obtain oak notes and sweetness. This will be accorded with the Corojo leaf that offers a spicy finish. Secondly, the blend of tobaccos has changed in order to adapt the flavour profile to something more consistent with the rum infusion. Therefore, I was very excited to sample this new cigar with Charles-Philippe while strolling around the beautiful city of Troyes, France. Featuring a glistening sheen, the Nicaraguan Barrel Aged has a lustre that ranges from fresh cinnamon to roasted coffee beans. The texture feels smooth with only a few yet thin visible veins. In terms of the rolling consistency, Camacho uses an in-house and secretive “Powerband”bunching process. Whatever this technique involves, it seems quite efficient in that there are no visible soft spots with a firm springiness to the touch. As for the aromas, the cigar gives off overt notes of spices combined with moist earth and dry matured straw. The smell is intoxicating and somewhat reminiscent of a freshly-polished oak table. Handmade cigars can vary in experience due to their individual variations and characteristics. Therefore, 4 Camacho Diplomas were smoked for this review between both myself and Charles-Philippe for a balanced evaluation. Despite Camacho’s acclaimed bunching process, every cigar is handmade so the experience may surely vary in terms of burn and flavour. Therefore, both Charles-Philippe and I smoked a few of these cigars each to fairly evaluate and compare the experience. Once cleanly cut, the pre-lighting experience is as you’d expect thanks to Camacho’s bunching technique. It’s very clean but with a slight resistance in the draw. It’ll be interesting to see how that holds throughout the entire smoke. As for the aromas, the pre-light is very flavoursome with overtones of oak as well as notes of sweet safran spice and a leathery finish. The experience is exhilarating and builds up the anticipation for the next moment. Although it may be catering to the obvious, but the first overt notes certainly evoked the rum. Nevertheless, this wasn’t a guarantee so it was fascinating to see them really come out throughout the smoke. This infusion created an interestingly sweet flavour profile that was interlaced with warm spices and earthy notes. Whilst the rum notes weren’t overly strong, their unique aromas made them the most noticeable. However, the cigar’s first third mostly consistent of earthy spices that ranged from cardamom to cinnamon and the safran detected in the pre-light. As I began to progress well into the 2nd third, I noticed that the spicy notes began to slowly drop off while the rum became even more apparent. The overall profile evolved with a bittersweet and heady bouquet that worked well with the newer notes. For instance, the oak flavours of the barrel had surfaced for a pleasantly woody tasted that contrasted nicely with a musky and sweet leathery note. Combined with the rum, this made an intense and very flavoursome experience. It seems that thanks to the ageing process, I didn’t experience much if any peppery notes. Personally, I’m not a fan of a peppery cigar so I was delighted to find that it was enjoyable all the way done. Even when well into the nub, the buildup of tar and nicotine didn’t make it off-putting. Throughout the final third, the tangible rum notes faded into an earthy combination of oak and leather. However, there was still a certain sweetness that could be detected throughout it. This made the leathery notes somewhat reminiscent of labdanum, which is a musky and heady resin. The Nicaraguan Barrel Aged’s construction yielded excellent results throughout the smoke. Whilst the ash’s backbone wasn’t overly strong, we still were able to maintain a stack of around 1.5 to 2 inches. As for the burn, early runners subsided very quickly when it stabilised. Consequently, the cigar remained even up until the nub. I’m usually a proponent of larger Gordo gauges and so I really smoke Robusto cigars. As such, I can be quite sensitive to the burn temperature that can be experienced in narrower cigars. Nevertheless, I found that the temperature remained quite cool throughout. Meanwhile, the ash’s colour was a lovely pale shade of brushed steel, which appeared to be very pure. With regards to the draw, the mild resistance encountered during the pre-light remained consistant and none of the cigars tried by either of us showed any issues. As for the overall smoking time, you can either puff away and finish this cigar in 40 minutes or take your time and enjoy it over 50. Although it sounds like I’m stating the obvious but here is a cigar to be enjoyed with a dark rum. Given the quality of the smoking experience, it would be best reserved for a premium aged rum. Alternatively, you could also consider pairing this cigar with some dry cider, Tawny port, a quality bourbon or even a peaty whiskey. Similarly, coffee would be a fine choice for those looking to pair it with something non-alcoholic. For those that prefer to nibble on something while they smoke, the sweet flavour profile means that savoury snacks aren’t the most ideal choice. Instead, opt for a very dark chocolate or even biscuits. Charles-Philippe raved that spéculoos would be a great choice thanks to the spicy flavours. These are spiced shortcrust biscuits with cinnamon flavours from the Netherlands and Belgium that are popular around Europe. Perhaps something similar to this such as gingerbread would make a fine choice. The Nicaraguan Barrel Aged cigars come in a beautifully-presented terracotta and black lacquered box with a felt base. Upon opening, the inside of the lid features a detailed design with a presentation of the flavours that would be experienced when smoked. A particular attention to detail that I loved was the branded hinges that feature the Camacho logo! Having purchased the Robusto Tubos, each of the cigars were individually sealed in tubes. These featured a similar design as the box with the black and terracotta colouring. In terms of the bands, this particular cigar comes with two. The first one at the photo heralds Camacho’s Powerband process whilst protecting it from any cracks or damage. Meanwhile, the main band is of a modern design that embodies Camacho’s roguish brand identity. The lettering is arranged at perpendicular angles with an eye-catching scorpion design. Like the Camacho Diploma, we particularly liked how the band reaches further around underneath to prevent glue attaching it to the wrapper. 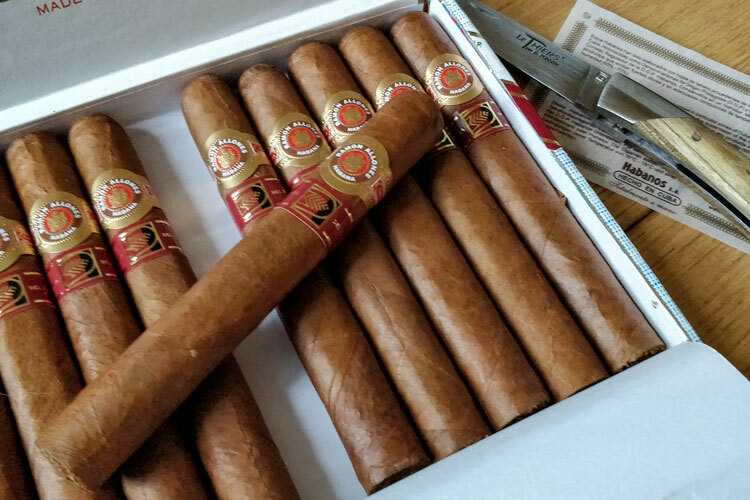 With regards to the value for money, our experience with each of these cigars has been that of a premium smoke. From the attention to detail in the packaging to the careful rolling process and meticulous ageing, the Nicaraguan Barrel Aged is an overall superb cigar. Therefore, when priced around the $10 mark per stick, it offers an exceptional value for money. When Should You Smoke A Camacho Nicaraguan Barrel Aged? As for reserving a particular occasion to smoke this cigar, it’s one of those that are quite versatile for different environments. For instance, you could enjoy one of these alone with a glass of something strong. However, you could even enjoy it with friends or in a more formal setting. That said, Camacho’s brand style isn’t particularly conventional so you should choose your audience wisely. If you’re in a private club or prestigious society, would the other members find it fitting? That is something that the smoker would have to decide his or herself. In terms of the time of day, this Camacho is a medium-to-full smoking experience. It’s not overwhelming so you could always have it a little later. However, it would be perfect as a post-dinner digestive to be enjoyed with a glass of rum or even a few sweet tidbits. Whilst the sweeter notes of the Camacho Nicaraguan Barrel Aged cigar isn’t for everyone, this is indeed a must-try for a unique smoking experience. At the end of the day, whether you’d enjoy this or not boils down to personal preference. However, we absolutely loved it and look forward to a few more shared over a glass of something refined. Reviewed by Paul Anthony, on 21 February 2018 . "A complex yet flavoursome experience. If you enjoy the flavours of rum, this infused and carefully aged cigar is definitely worth your attention."